Arundel & South Downs MP Nick Herbert is backing an anti cyber-bullying campaign started by his constituent, TV personality Katie Price. Katie invited the MP to a meeting at her home to discuss an online petition which she has started that is calling to make cyber-bullying a specific criminal offence. Katie described in graphic detail the vile trolling and abuse she has received but which was targeted at her disabled son Harvey and raised concerns that the police don’t have enough powers to arrest offenders every time an incident occurs. Katie told Mr Herbert that although she is used to online abuse aimed at her, it is not acceptable for her son to be the target. She wants to protect everyone, especially children and those unable to defend themselves, from suffering from online bullying. At the end of March Katie launched an official government petition - ‘Make online abuse a specific criminal offence and create a register of offenders’. Within days, and thanks to Katie’s public profile, the petition gained over 200,000 signatures. This means that the petition can now be considered for a debate in Parliament. Mr Herbert welcomed Katie’s initiative in starting the petition and for raising the profile of this modern form of bullying. He explained that the issue has already been the subject of debate in Parliament and that Government has been talking to internet providers, but that more could be done. The MP has given Katie his backing to the campaign and undertaken to raise the issues in Parliament. Katie said it is her hope that schools will do more to educate children to teach them that cyber-bullying is socially unacceptable and damaging. She added that internet providers have a responsibility too and should look at what more they can do to help prevent the rise of online bullying. Nick Herbert said: “It was a pleasure to meet my constituents Katie and her mother Amy. I think Katie is doing a really good thing by drawing attention to this horrible form of bullying and the need to do more to tackle it. Her online petition has gained enough support to be debated in Parliament, where these issues should be addressed, and I will gladly take them up. 1. 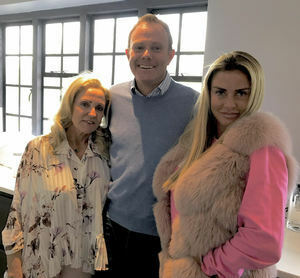 Photo: Amy Price, Nick Herbert MP, Katie Price. 2. The link to Katie Price’s government petition can be found here https://petition.parliament.uk/petitions/190627.